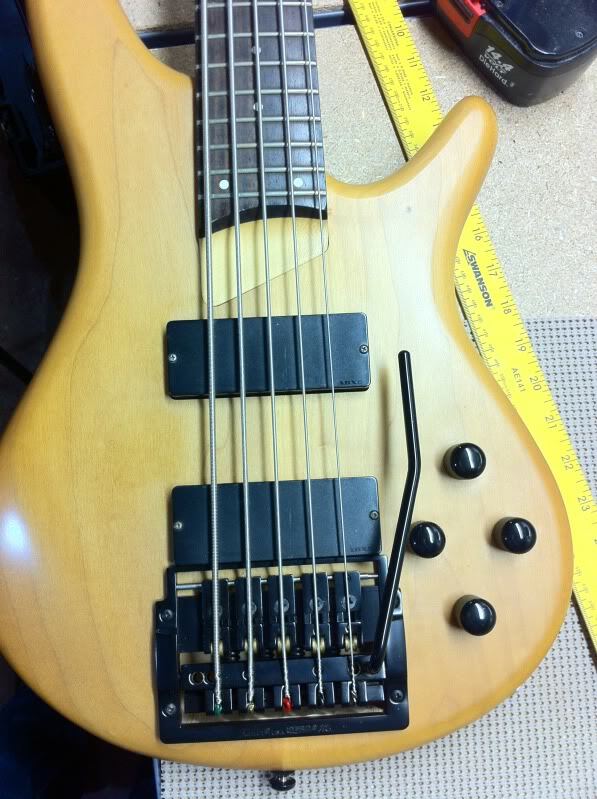 Kahler on Ibanez SR505 - Looks nice, need help!!!! Hello folks!!! This is my first post here after lurking for a little bit. So then I got out my router, went with the template, and did the deed. Mounted the bridge (and new graphite nut) and strung 'er up. Truly a thing of beauty!!!!!! Do I need new springs? Did I set something up wrong? Anyone else have this issue? Greetings Clint! Welcome to BTF! 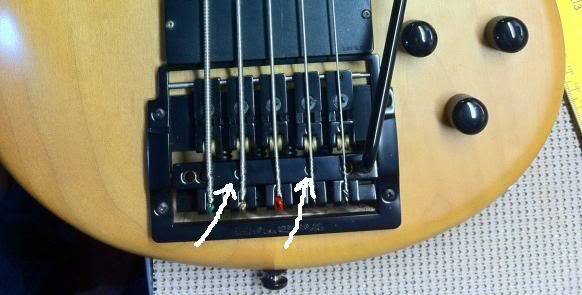 You want to slowly crank those down a little at a time until the trem levels out. Be careful, as it is possible to make the screws drop out the bottom. These screws increase the tension on the springs, and the trem angle will rise to a level position. Now, this will also increase the tension on the bar, and you'll find that it takes a little more effort to drop the thing. Also, this will decrease the amount of upward pull you can get, but it will increase the amount of drop. I hope that helps, Bro! Keep us posted as to how it works! BTW, are you having any issues with string action? Our normal thing around here is to have a Kahler countersunk into the body, instead of sitting flat on top of the body as yours is. How is it working for you? welcome to the board BMG. there is an adjustment screw that will angle the trem back so your bar is not horizontal, it is in the middle of the cam under the strings. it pushes on a plate underneath that angles the cam back so when it is at rest the bar will stick up farther. Yes ...tighten down the cam bolts till you get the home position and travel you want. Fiddle with it a bit till you get it where you like. 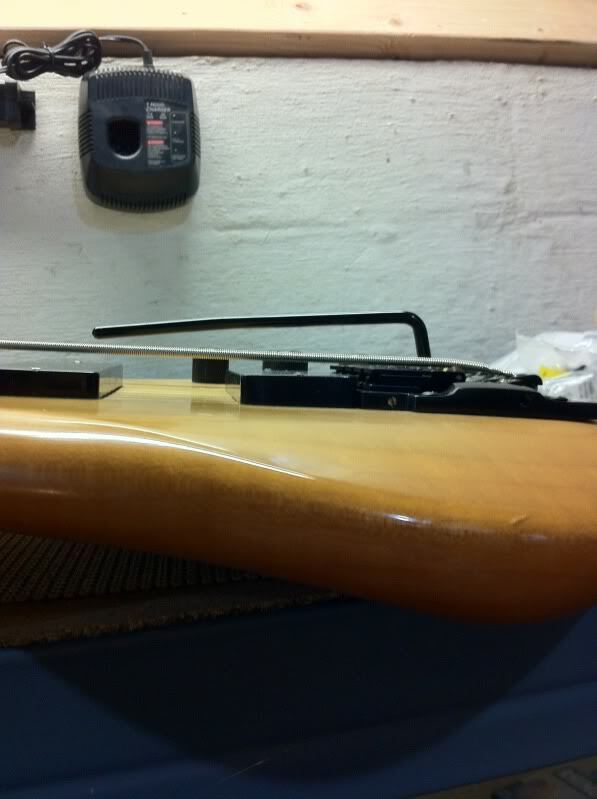 Yes ... ibanez, just looking at yours and having done an edb 600, you will need to countersink the entire base of the trem one sixteenth to one eigth inch into the surface of the bass to get the correct action on your string heigth without the strings buzzing on the roller saddle housings forward of the bridge rollers. Careful around the pickup cavity. No worries, Bro! I think we posted at the same time! Thank for the advice!! I adjusted the cam screws and that did help a bit. I also bent the bar in a vice, so that brought it up as well. But like you said Eric, the action is a little high even after lowering the saddles as far as I dare. I might sink the entire bridge as well. You're welcome, Clint! It is indeed an ongoing process, and we are all still learning as players about every aspect of bass playing. Hopefully, with the collective knowledge of the group, we can all figure out how to use our trems! it's funny when you look at that huge thing on that unit when your holding it up in the video. 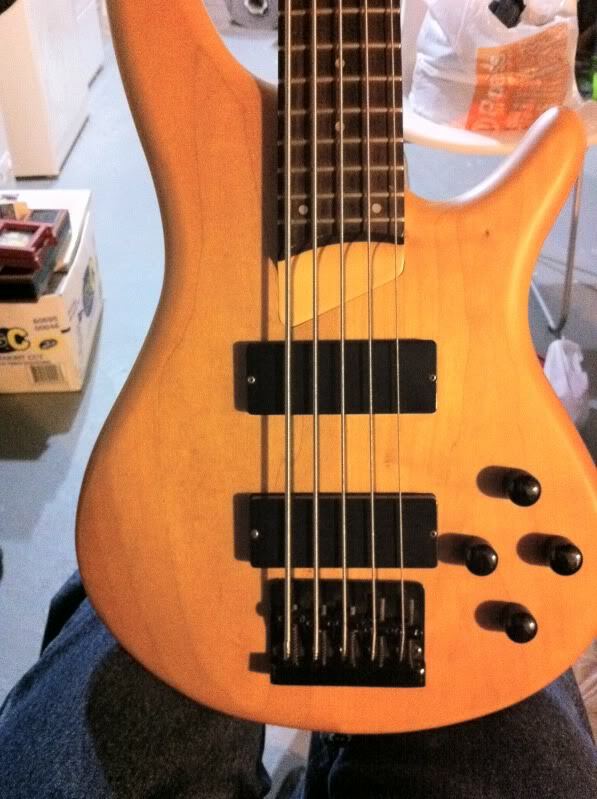 Subject: Re: Kahler on Ibanez SR505 - Looks nice, need help!!! !